We use the Henri Matisse collage, “The Horse, the Rider and the Clown,” as our inspiration for this project. 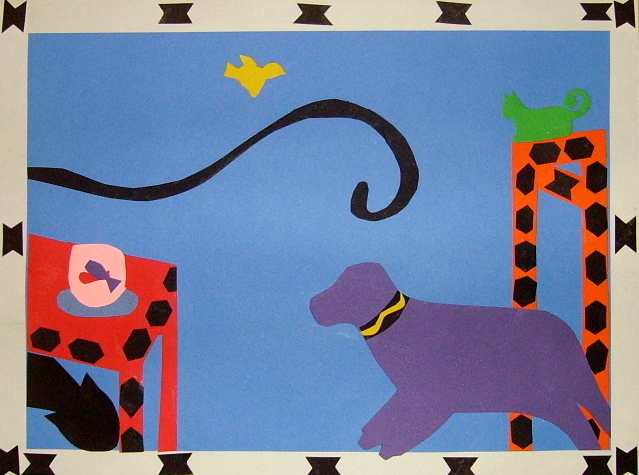 On the website, http://www.henri-matisse.net/cut_outs.html find information about how Matisse found his way to, as he called it, “painting with scissors.” You’ll find this project, “The Dog, The Cat and the Panther,” in the 5th Grade Projects Gallery in the sidebar. Click on the image for a close-up view. This entry was posted in 5th Grade and tagged 5th Grade, art and crafts for kids, art like henri matisse, collage, henr matisse inspired art for kids, henri matisse, paper art, the cat and the panther, the dog. Bookmark the permalink.